Several years ago a food writer and cookbook author told me that it would be a good idea if I learned to work at least one season ahead. 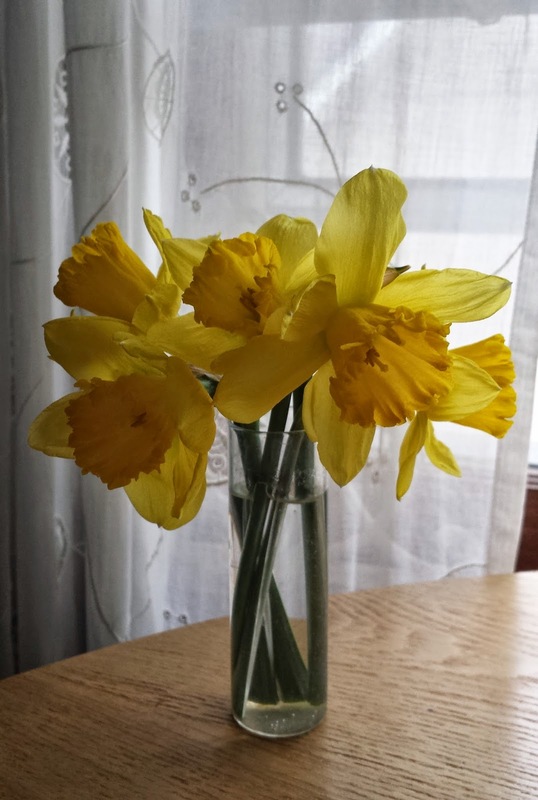 This way my menus…class offerings….anything I might be writing….would be ready when the appropriate season arrived. Alas, I have never fully mastered the ability to do this. Today’s post is a good example. Yesterday was the first full day of Spring—and it was a glorious first day of Spring where I live….sunny, warm......everything on the verge—and here I am, posting a recipe for a late winter vegetable crostata. It is true that I could wait until next winter to share this recipe (in which case I could think of myself as a super-planner: “I’m three seasons ahead!”), but as it happens I have a good reason to want to post it now. If you follow along with me on a regular basis, you might remember a post I wrote a couple of weeks ago about the importance of having a handful of basic recipes that you know so well and make so often that you can make them—and improvise with them—on a whim or as the occasion demands. Like the almond and chocolate braid in that post, the winter vegetable crostata that I’m sharing today fits perfectly into this category, thus making a nice follow up post. If you know how to make short crust pastry (and really, everyone can learn to make a respectable short crust pastry...it just takes a little knowledge and a little practice) the makings of a delicious dinner are almost always within reach. Often, you will be able to use ingredients that you already have on hand. Among other things, short crust pastry (a.k.a.pâte brisée or pie dough) can be turned into empanadas or turnovers, a quiche, a formal tart….or a rustic crostata/free form tart. 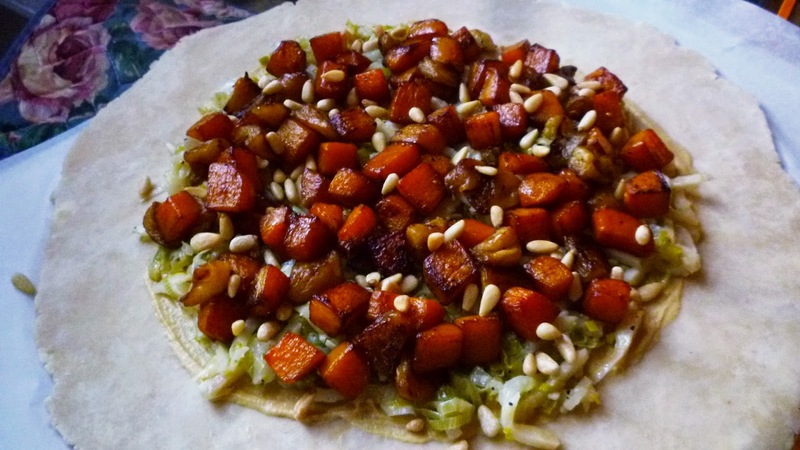 The night I made my winter vegetable crostata, I had a lot of odds and ends in my refrigerator…. Half of a celery root…. A chunk of butternut squash…. (The reality of life in a two person household is that rarely do you use all of either of these two for one meal…unless you’re making a puréed soup….). I also had a couple of cups of thinly sliced and washed leeks (left from some over-zealous purchasing for a private event) and a lone golden delicious apple (my favorite baking apple, but not one I’m likely to snack on). I had other leftovers too, but these four seemed like they belonged together. 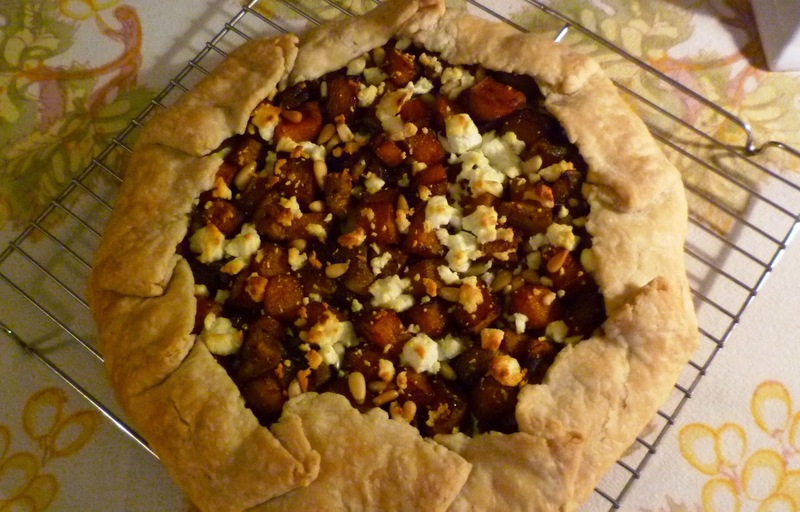 I suppose there are a lot of things I could have made with these items, but as I pondered them, it suddenly seemed obvious that with the addition of half of a package of goat cheese (also a leftover) I had the makings of a delicious crostata. The crostata itself is one of these basic/workhorse recipes…creating one is easy, as long as you learn a few basic guidelines. The filling shouldn’t be liquid (as for a quiche custard) since it might leak and create a mess in the oven. (Save liquid fillings for a more stable, traditional tart shell.) Also, since the crust cannot be pre-baked, always put something in the tart first that will act as a bit of a barrier—protecting the crust from becoming soggy before it has the opportunity to cook through. Cheese works well for this….or a layer of caramelized onions…or even just a thin smear of Dijon. To fill a crostata, simply layer in a pleasing combination of cooked ingredients (raw ingredients can release a lot of water as they cook—producing a watery filling and possibly a sodden crust—despite the presence of a “barrier”)…always remembering that less is more. You might have noticed that I said I had “other leftovers” that I chose not to use when I prepared my crostata. Only include components that complement one another and are needed to produce a well-rounded, harmonious whole. Add flavor exclamation points with garlic, herbs, spices, olives/capers/anchovies, nuts, dried fruits, cheeses, etc.,…incorporating them when you cook the individual components, or layering them in as you build the tart. You can cook the filling ingredients for your crostata however you like, but for the most part I prefer methods that don’t introduce more liquid. Roasting, sautéing, grilling/broiling, sweating or étuvéeing* produce the best results. Étuvéeing is particularly useful since it produces cooked ingredients that are still moist, and yet are not so wet that they will release more water when they are baked again in the tart. As I pointed out above, you don’t want a wet filling…but neither do you want a filling that is so dry as to be unpalatable. and sautéed the squash and apple together (finishing them in the oven). When I began, I thought I would wilt the leek by itself and then dice and roast the celery root, butternut squash and apple together. But as I thought about it, I decided that I preferred the softer, sweeter flavor of celery root that has been étuvéed (roasted celery root can be bitter). 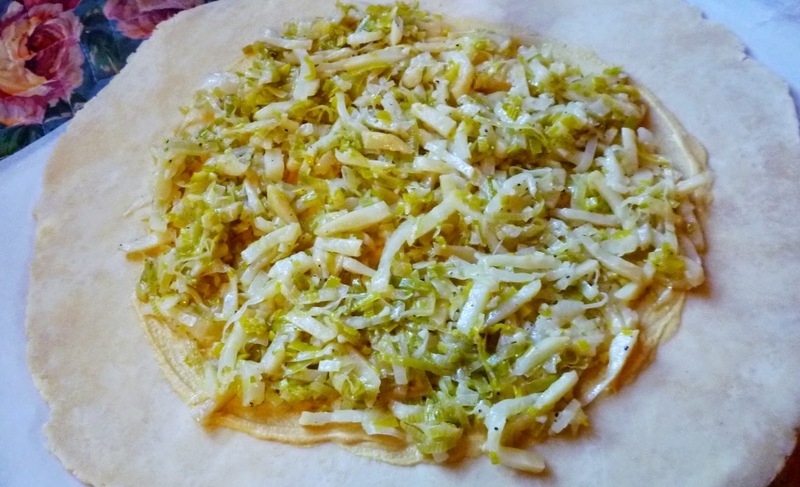 Étuvéeing the celery root with the leeks also served to increase the volume of the portion of the tart that, while not wet, was inherently moist. In the end, the apple—which was the ingredient that had me a bit stumped when I first considered the ingredients (I almost left it out)—was what really lit up the flavors of the tart. It added a contrasting tangy sweetness that I loved. In fact, we loved this tart so much, I will definitely be making it again. 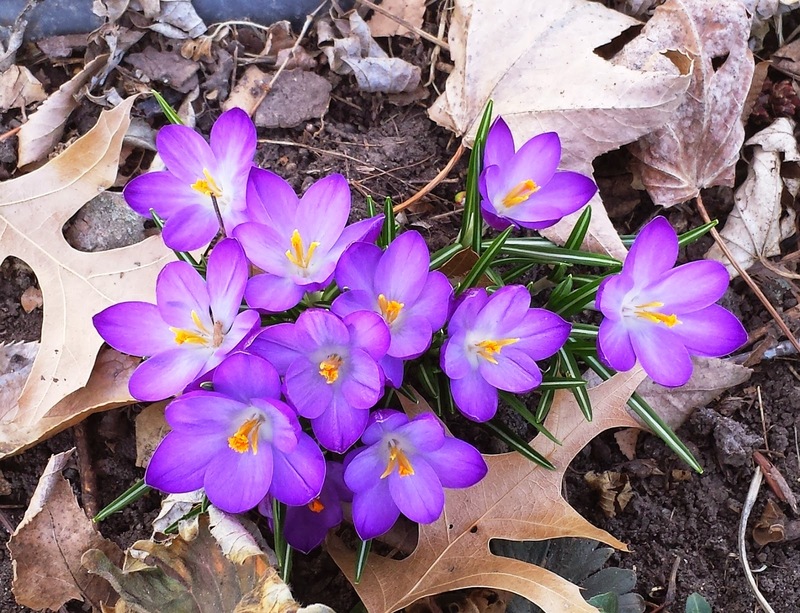 And since spring is just getting started….and the weather is still a bit unstable…I might even make it again this year. Roll out the crust: Let it warm up for a moment or two at room temperature. Line a baking sheet with parchment paper; set aside. Roll out the dough on a lightly floured surface into a circle that is about 1/8-inch thick and is about 13 inches across. Trim any ragged edges. Brush off the excess flour. 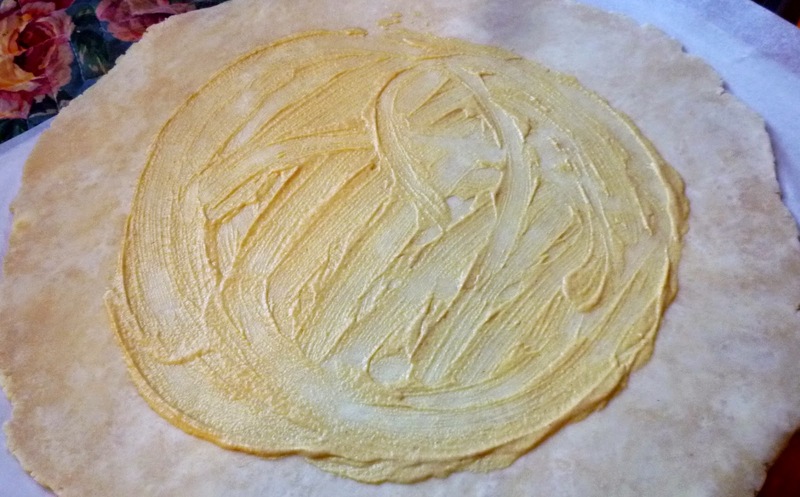 Transfer the dough to a parchment lined baking sheet. Cover loosely with plastic wrap and chill for at least 30 minutes. Melt 2 T. butter in a medium-sized sauté pan that has a tightly fitting lid. Add the leeks and celery root along with a pinch of salt. Toss to coat in the fat. When everything begins to sizzle gently, reduce the heat to low and cover. Cook until the leeks and celery root are tender—about 20 to 30 minutes. If there is any liquid remaining in the pan when the vegetables are tender, uncover and continue to cook until the liquid has evaporated. Taste and correct the seasoning. Set aside to cool. While the leeks and celery root cook, heat a tablespoon of olive oil in a sauté pan set over moderately high to high heat. 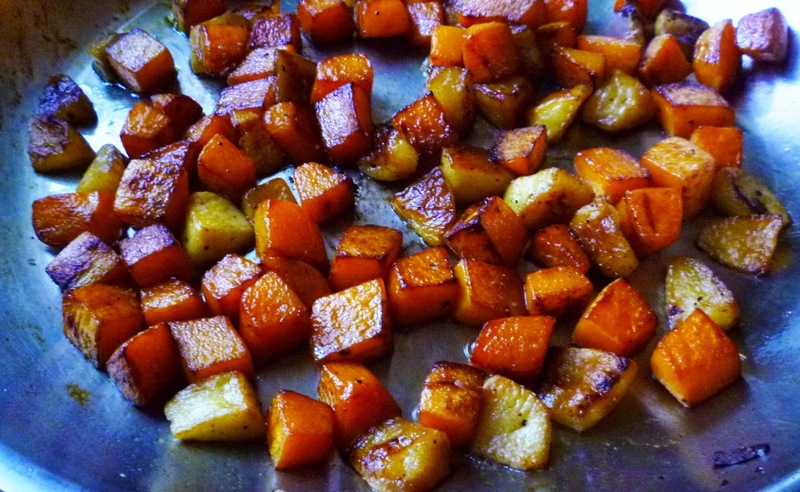 Add the squash and apple and sauté until tinged with golden brown. Transfer to a 375° oven and roast, tossing occasionally, until tender—about 20 to 30 minutes. About five minutes before the squash and apples are done, add a half tablespoon of butter to the pan. Taste and correct the seasoning. Set aside to cool. followed by the squash and apples. 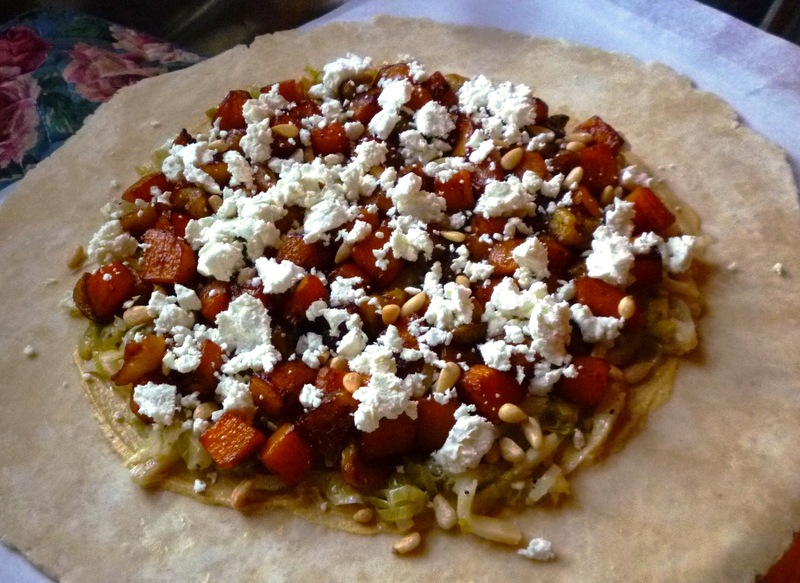 Scatter the pine nuts and crumbled goat cheese over all. Pull up the edges of the crust and gently flip them over the filling to form a wide, rustic edge. Pleat the dough as necessary, pressing lightly into place. Transfer the baking sheet with the tart to a preheated 375° oven, placing the pan on the lowest rack or on a pre-heated stone set on the middle rack. Bake until the cheese is tinged with brown and the crust is crisp and golden brown—about 40 to 45 minutes. Drizzle the tart with olive oil if desired and let rest for 5 minutes (or cool until just tepid) before serving. 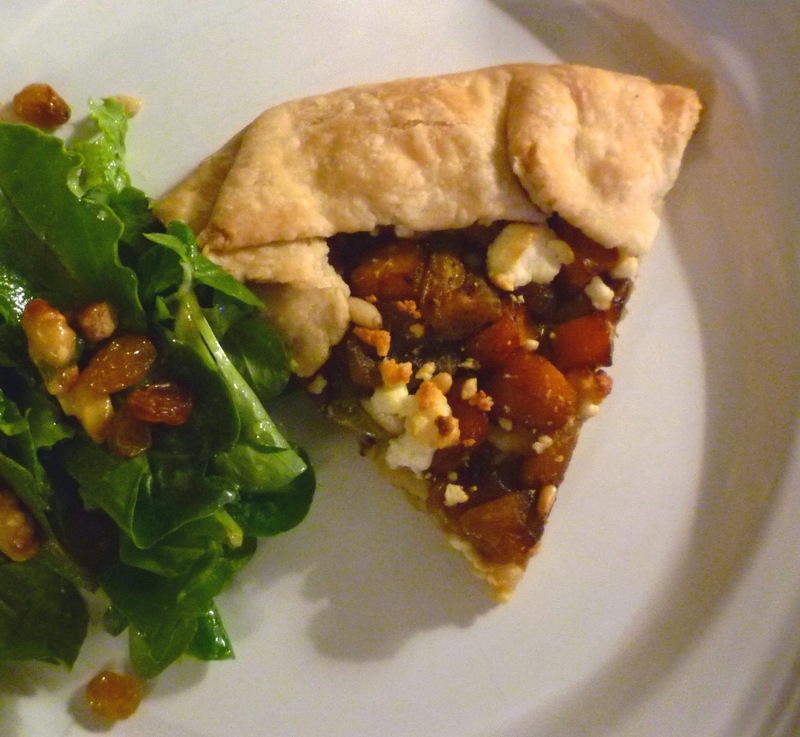 Tart serves 4 as an entrée, or 6 to 8 as an appetizer with a small salad. 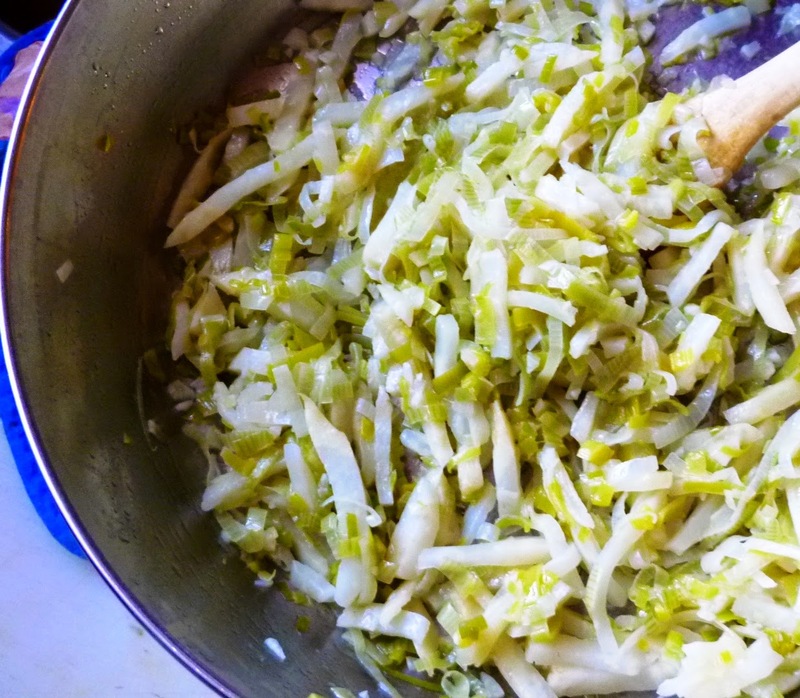 Add a clove of garlic, minced, to the leeks as they cook. Add a tablespoon of picked thyme or minced sage to the leek mixture. 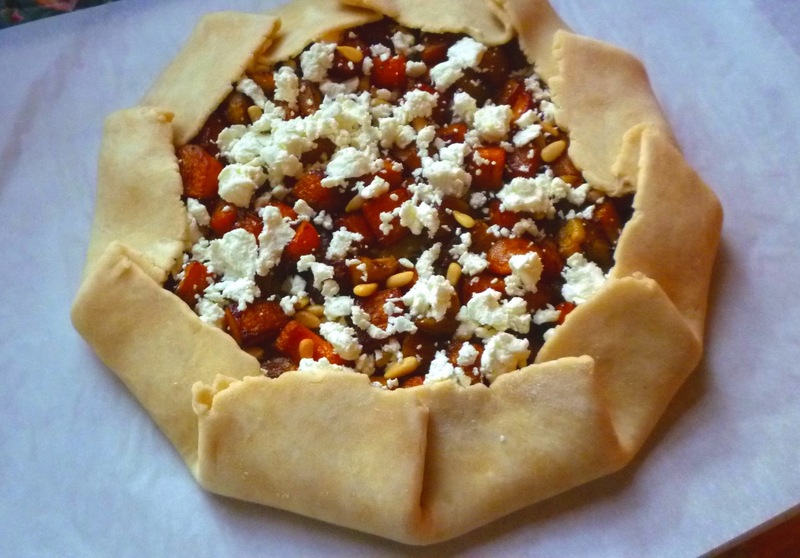 Omit the apples and scatter a handful of golden raisins (plumped in hot water and drained) over the tart before adding the pine nuts and goat cheese. Substitute a pear for the apple. *The present participle of the French word étuvée is not, I think, technically a word. There really isn't a good English translation for this French technique. If one is “étuvéeing” something, in French one would “cuire à l'étuvée”…or “cook in the manner of étuvée”…which is cumbersome in English. I described the method in a previous post, but basically, it means to cook something over low heat, in a bit of fat, and covered tightly so that it cooks very gently in its own juices.